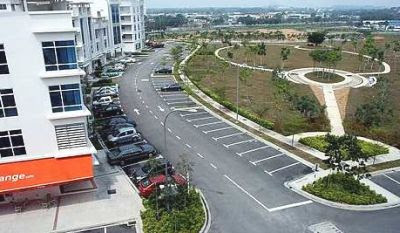 Already open: The first phase of the i-City project has been completed. The Shah Alam City Council (MBSA) is going easy on its strict rules on entertainment outlets in the city as part of efforts to attract foreign investors to the knowledge-based i-City development project. With such a policy in place, Shah Alam residents may, within the next few years, see the city’s first cinema with the approval for the facilities having been granted. The cinema is part of the final phase of the i-City, which comprises a shopping mall and a citywalk which are scheduled to be completed in 2015. The intelligent centre is located at Section 7 of the state capital. “We are making an exemption for the i-City to encourage international companies and franchisors to invest in the intelligent centre,” Shah Alam mayor Mazalan Md Noor said. “But they still have to adhere to the existing rules and regulations, especially on the operating hours,” he said. According to Mazalan, the i-City had been conferred the International Park status by the Selangor government in October last year, allowing it to operate entertainment and lifestyle outlets such as cinemas and theatres, bowling alleys, family theme parks, restaurant and clubs. He said although the International Park status also allowed restaurants in the i-City to sell liquor, this was not an automatic blanket maxim but subject to approval by the MBSA. “In principle, we are going easy on the ruling for them, but it does not mean that it is automatic permission. The operators still have to apply for permits and we will look into their cases to make sure that they abide to the guidelines,” he said. Mazalan said he hoped that the move would serve as a catalyst in boosting the development in the state capital. “We hope the i-City, with its modern infrastructure and high-tech facilities, will function effectively as the city’s knowledged-based centre,” he said. “We want the i-City to be an icon for the city and hopefully will be emulated in other areas of the city,” he said. Shah Alam, with about 90% its population being Muslims, has always been strict on the entertainment outlets, with cinemas, pubs and snooker centres being banned. But the city is a beautiful place to live, with its many natural parks and a handsome lake too. Traffic chaos is also almost unheard of in this garden city of orchids. Having a cinema and other modern high-tech facilities in the i-City will complement the other cultural and recreational elements available in Shah Alam. Residents and visitors can enjoy regular cultural activities at the Laman Budaya and soon watch theatre performances at the Shah Alam Royale Theatre. “We are also processing applications from karaoke centres, so the residents will soon be able to enjoy that too,” Mazalan said. Allowing the cinema to operate in the city has received mixed responses and reactions from the Shah Alam residents. Even the city councillors are split on the matter. While some people agree with relaxing the rules, others feel that the city should maintain its sober identity, with no entertainment outlets. “All the while we did not have any such outlets and this is what the residents want. Having such facilities would not make Shah Alam any better and might even result in negative influences and impacts, especially among our youths,” said Datin Nor’ini Md Top, a councillor in charge of Section 7. “So I do feel that we should stick to the the status quo - no cinema,” she said. Nor’ini said the MBSA should not make an exception to the i-City centre as other similar developments would also demand to be given similar concessions. She felt that the authority should not bend the rules just to encourage more foreign investors to come and start their business at the i-City. “Why do we have to sacrifice our own culture and ethics just for the sake of encouraging foreign investors? “Unless the operator could ensure that they would only conduct constructive and educating activities, I believe we should stand by what the residents want,” Nor’ini said. Councillor Ang Leng Kiat said the MBSA would have to make sure that the i-City operators provide healthy activities for the people. Ang said it was only fair to seek the views of the residents on what they wanted. “We are serving the people and if they want a cinema, then they should have it,” he said. “But we have to make sure that the cinema operator adhere to our rules and regulations,” Ang said. Adnan Jamburi said that relaxing the rules would be a boost the development and property value in the city. He said the move would bring in foreign investors to the city, which was needed especially during the current economic slowdown. The Malaysian property market is showing signs of recovery, albeit at a slow pace, attributed to government spending and developers taking a cautious stance during the economic downturn. "We are recording higher property volume, but lower value. The price is not plunging. It is just that the lower bracket of properties are selling now," said Dr Zailan Mohd Isa, director of the Valuation and Property Services Department under the Ministry of Finance. According to data provided by the department, there were 23,256 unsold completed residential units in Malaysia as at March 31, 2.1 per cent lower than the same quarter last year. In addition, there are 15,723 units with approved building plans - launched, but not constructed. Last year, the figure was 18,402 units. For unsold properties under construction, there are 49,904 units versus 53,619 units last year. "Due to the economy slowdown, developers have been cautious. Hence, there were less new products in the market. But overall, the performance in the sector remains healthy but most importantly, the government has to secure jobs, facilitate domestic spending and control inflation," he said. Zailan was speaking at a media conference in Kuala Lumpur yesterday, in relation to the 20th National Real Estate Conference that will be held from August 11-12 at the Kuala Lumpur Convention Centre. The event is hosted by the Association of Valuers and Property Consultants in Private Practice Malaysia and Institution of Surveyors Malaysia. The conference will underline issues faced by the real estate sector, covering residential, office, retail, hotel and industrial markets. Organising chairman Elvin Fernandez said the conference was timely and important to re-calibrate the fundamentals in the Malaysian real estate market. He said there is a self correction mechanism in the market now as the country's 2,000-odd developers are holding on to their launches. 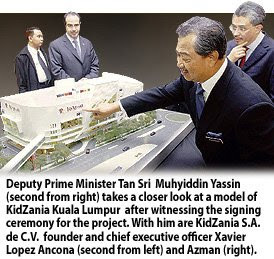 A RM50 million educational theme park from Mexico, KidZania, will open by early 2012 at a new building in Mutiara Damansara in Selangor, just across from the Curve shopping mall. The award-winning indoor park, which allows children to role-play adult occupations in a replica city with activities designed to mimic real-life and functioning economy, is popular in cities like Tokyo and Jakarta besides its home country. "It is a commercial investment but it also hits the right note on all fronts. We are excited. This world-class facility will fill the current void of entertainment and education in our tourism sector," Khazanah Nasional Bhd managing director Tan Sri Azman Mokhtar said at a press conference in Selangor yesterday. Once completed, the park will create 400 jobs in the service industry, he added. The project, an 80:20 joint venture between Khazanah and Boustead Holdings Bhd, is the second theme park investment for Khazanah after the RM750 million Legoland in Iskandar Malaysia. KidZania Kuala Lumpur is expected to attract 500,000 visitors a year. Boustead, developer of Mutiara Damansara and owner of the Curve, will tear down a building currently occupied by McDonalds to build a seven-storey structure to house KidZania Kuala Lumpur. The theme park will take up about 60,000 sq ft on levels six and seven of the new building, which will be linked to the Curve via a sky bridge. Xavier Lopez Ancona, founder and chief executive officer of KidZania S.A. de C.V., said Khazanah may recoup its investments in as soon as five years based on the hot response for its parks in Tokyo and Jakarta. "The typical payback period for theme parks is around seven to nine years," said the Mexican entrepreneur who started the first KidZania in the Santa Fe Shopping Mall in Mexico City in 1999. Entrance fees in Jakarta are priced around US$12-US$13 (RM42-RM46) for kids, while accompanying adults pay a lower price of about US$9 (RM32), Ancona said. Other operating revenues also come from food and beverage sales and fees paid by marketing partners who want to put up their brands in the mock-up city. KidZania also owns and operates another park in Monterrey, Mexico. It is building a third one in the country at Cuicuilco. Outside Mexico, KidZania operates through franchise in Lisbon, Portugal; Jakarta, Indonesia and in the Japanese cities of Osaka and Tokyo. In Tokyo, tickets are sold out every day since its opening in 2006, with 955,000 visitors last year alone. New KidZanias are coming up in Dubai, Seoul, Shanghai, Bangkok, Santiago (Chile), Mumbai and Istanbul. KHAZANAH Nasional Bhd says it sees "no major issue" in finding new investments to replace the Dubai property developer which recently dropped a land purchase deal in Iskandar Malaysia. Damac Properties (Malaysia) Sdn Bhd, one of Dubai's largest private developers, recently said it would not pursue the plan to buy land in Nusajaya for RM396.5 million. "It's not a major issue. The Damac plot of land is a good site and there is interest shown for the site. "We are confident there will be replacement coming in," Khazanah's managing director Tan Sri Azman Mokhtar told reporters in Petaling Jaya yesterday. MULPHA International Bhd is confident of withstanding the challenges arising from the unprecedented global economic turmoil. Its executive chairman, Lee See Huang, said companies faced problems and hoped for recovery to grow. "We are confident of the quality of our developments and assets and have a strong balance sheet to ride out of the current economic storm," he told a media briefing after the the company's annual general meeting today. Mulpha is involved in real estate and property-related and financial services, with operations and investments in Malaysia, Vietnam, Singapore, China, Hong Kong and Australia.